We all know farmers can do with some championing. This time of year, with the farm workload increasing, farmers can be under extra strain. Waikato-based Agsafe NZ Ltd is a resource for farmers and rural workers, specialising in rural workplace safety. Jim Findlay knows a safe and healthy workplace is one of the keys to a successful business. Having been a farmer himself, he understands how stress and fatigue can impact the day to day running of a farm. “At Agsafe we make sure farmers have policies to deal with stress and fatigue. We encourage them to know about it, understand it and recognise what causes it,” says Mr Findlay. Agsafe NZ Ltd consults with farmers to prepare hazard management programmes, like making sure farm workers eat plenty of good food and get enough rest. “It’s important to have a decent breakfast in the morning, take a bit of time off during the day and take a three-day weekend at the end of the calving or lambing period,” says Mr Findlay. 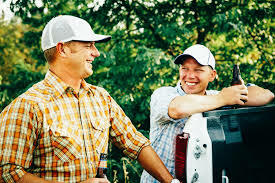 “Something else you can do is buddy up with another farmer or two in the district and have a regular beer or a coffee. Just that little bit of time out for relaxation is something we all need,” says Mr Findlay. “We all know what it’s like when five o’clock rolls around and you just feel like sitting down with your colleagues and having a beer and some social time. That’s something farmers miss out on. They just carry on working”.